One evening in November, we visited the Paseo Herencia Plaza, in the Palm Beach area across from the Holiday Inn. We noticed how the whole plaza, restaurants and store fronts had been decorated for the Christmas holiday. It was awesome! We walked around, did some shopping at the Aruba Aloe store, had dinner, watched the giant big screen TV and waited patiently for the liquid light show to begin. Of course, our Grandson CJ, had to ride the Bumper Boats (with a life jacket since the water is deep), while other children enjoyed the gigantic Ball Pit. People were sitting around the plaza enjoying drinks and conversation. On Saturdays and Sundays: from 5pm – 8pm, there is a Kid’s Village that features Dino Jump, Face Painting, Clown Animation, Balloon Sculptures, Magical Shows and more. On Mondays: at 8pm, there is Culture Night which includes a Cultural Dance Show by a local dance group performing on the main stage. Every night: at 7:30, 8:30, 9:30, and 10:30pm, there is the Waltzing Water Show with lights and music. The Paseo Herencia has many Fashion & Clothing stores, Jewelry & Accessories shops, Island Tours & Excursion Booths, Shoes, Sunglasses, Handbags, Watches, Gifts & Souvenirs, Cigar store, Golf store, Perfume & Cosmetic shop, and a Mini Market. It also features an Internet Café and Business Center. If you run out of money you can always use the ATM machine. If you get hungry or you need a snack or beverage, you are in luck. The following is a list of the restaurants and shops you will find at the Paseo Herencia Plaza. 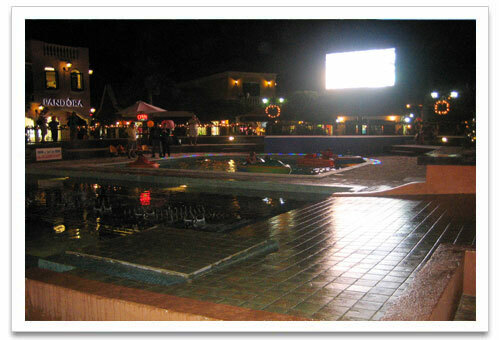 Paseo Herencia Plaza is where you will find ZIZZLES, which is a restaurant and also features a live show. Ask your hotel concierge for a free copy of Paseo Herencia’s Monthly Calendar of Events. This flyer will allow you to park free if you bring it with you. Or you can enjoy an evening walk to the Plaza, if you are staying at one of the resorts on Palm Beach. We really enjoyed the evening we spent at the Paseo Herencia. What a lovely evening for the whole family, I highly recommend it. I suggest you check out the Palm Beach Plaza Mall for more fun.